NASHVILLE -- When the first enemy bullet hit their HH-60 Black Hawk helicopter, Sgt. Armando Yanez and Cpl. Emmanuel Bynum initially thought the loud bang was from the metal end of a tether that fell. Then more gunfire peppered the helicopter. By the time the 101st Airborne Division (Air Assault) crew finished the medical evacuation out of a hot landing zone in eastern Afghanistan, nearly 30 bullets had struck the aircraft. 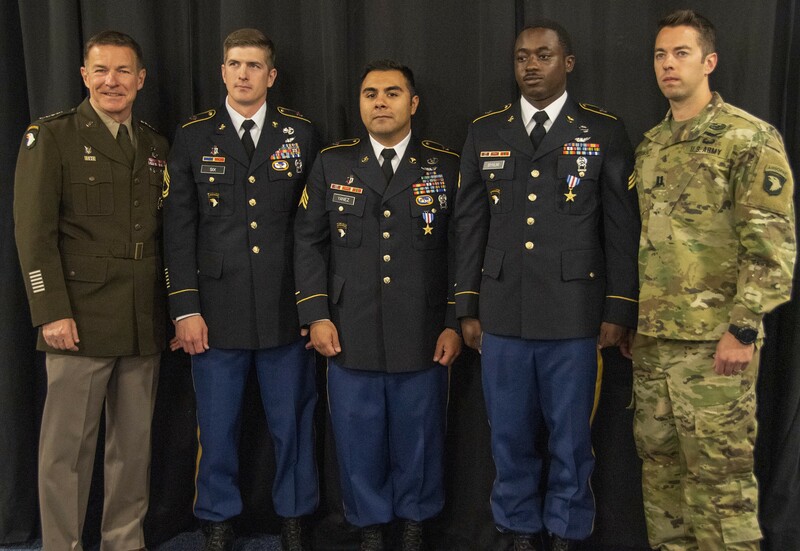 On Tuesday, Army Vice Chief of Staff Gen. James C. McConville awarded Silver Star medals to Yanez and Bynum, now a sergeant, for their heroic actions in the July 12 mission as they attempted to save a wounded Army Ranger. "Every generation has its heroes, and today's generation is no different," McConville said after his speech at a conference hosted by the Army Aviation Association of America, or Quad A. "These two heroes risked their lives … and their valiant efforts symbolize the best of this generation." 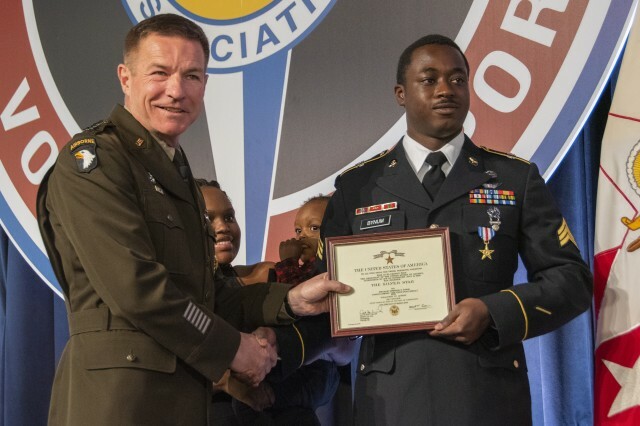 While at Forward Operating Base Lightning, the aircrew -- Dustoff 24 from the division's 6th Battalion, 101st Combat Aviation Brigade -- received a call around dawn to transport an Afghan soldier with a chest wound. As the helicopter approached the landing zone, they began to take small arms fire. "We didn't realize we were being shot at until we actually landed," Yanez said. 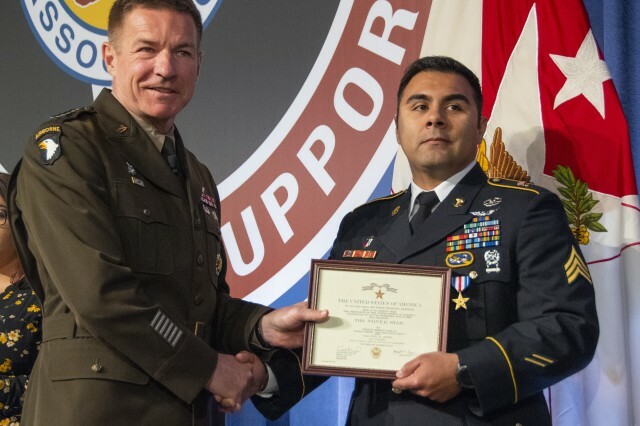 Yanez, the flight paramedic, jumped out and rushed 100 meters to receive the patient, who was then carried to the helicopter on a litter by Army Rangers, who had been on a mission with Afghan forces. Bynum, the crew chief, and Sgt. 1st Class Andrew Six, a combat medic, also exited the aircraft to provide security. As the crew lifted off with the patient, who would survive, one of the Rangers, Sgt. 1st Class Christopher Celiz, stayed behind to pull security next to one of the landing gear tires. About 10 feet off the ground, Bynum said he noticed Celiz fall down. "After we picked up, that's when it dawned on me that he had been shot," Bynum said. Once in the air, the helicopter, flown by Capt. Benjamin Krzeczowski and Chief Warrant Officer 2 Jonathan Cole, banked to the left and looped around while Bynum helped safely guide it behind a building. As the aircraft landed, a group of Rangers hurried to the door with Celiz and helped load him in. Enemy gunfire still peppered the aircraft. While back in the air, Bynum said he glanced out one of the windows and saw two bullet holes through the plexiglass. Bynum said he had barely noticed the enemy gunfire during the rescue mission. "I just did what instinct told me to do," he said. "We were just so focused on the mission," Yanez added. "With the training that we've done, we felt like we've done this a lot. There was no panic from anybody in the crew." As the helicopter quickly flew to a nearby medical facility, Yanez and Six put all their attention on Celiz, a 32-year-old assigned to the 75th Ranger Regiment. "We did everything that we were trained to do to try to save his life," Yanez said. "Unfortunately, he didn't make it." Knowing what he knows now, Yanez said he would have done the same mission again. "We're going to get him regardless," he said of Celiz. "We're not going to leave anybody behind no matter what." 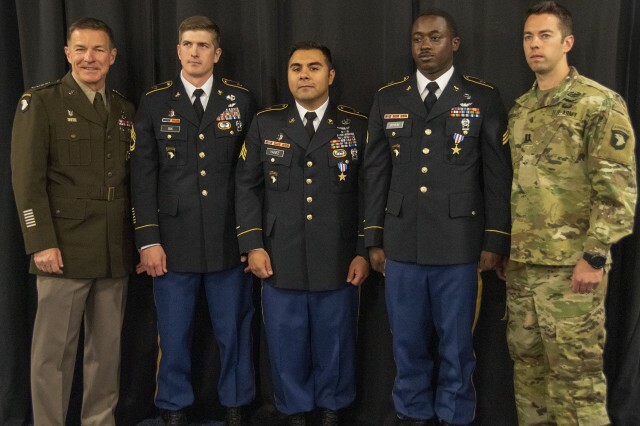 In January, all five crew members were awarded the Distinguished Flying Cross during a ceremony in Kabul. 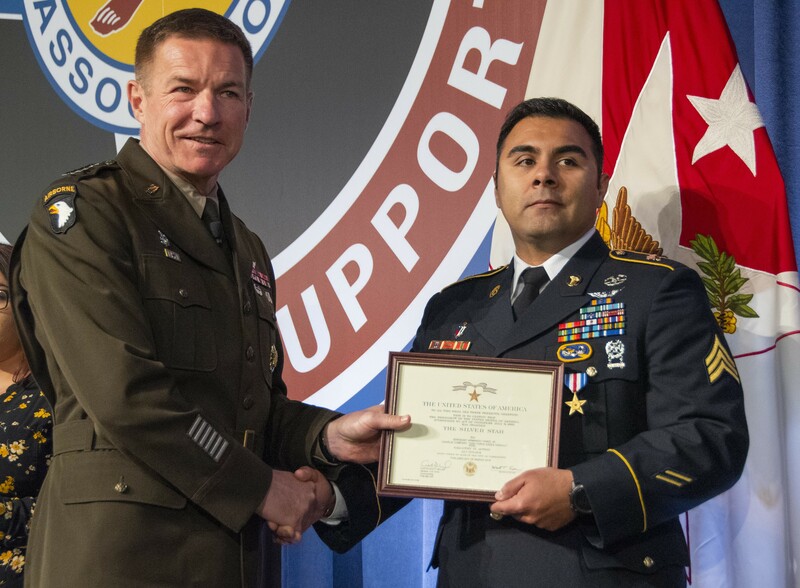 Yanez's and Bynum's awards were later upgraded to Silver Stars, the third-highest military combat decoration. To help keep his memory alive, Yanez now wears a metal bracelet with Celiz's name etched into it. When people ask him about it, Yanez tells them about the Ranger who sacrificed his life to protect his crew. "I feel like I was connected to him somehow on that day," he said. "In my mind, he's my hero." Bynum said he would also wear his Silver Star in honor of Celiz. "We did our job, yes, but he was the one who put his life on the line for our safety," he said. "He's the real hero of that mission."